Reading that quote from a new Kindergarten parent describing the sugar overload at her child’s school took me back seven years to when my oldest started school. I was surprised to see so many practices that undermined student health such as using food as a reward, class parties overloaded with sugar, junk food fundraisers and schools used as ads for soda and fast food. I navigated these sticky situations by trial and error until connecting with other parents and organizations who were working to create healthier schools. 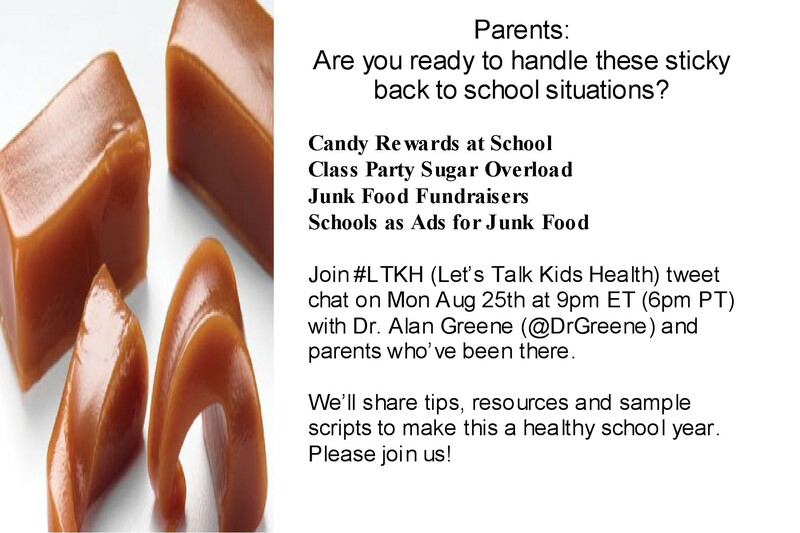 We’ll also have a #LTKH (Let’s Talk Kids Health) twitter chat on Monday, August 25th at 9 pm ET to share even more ideas. Please join us! Tags: Dr. Greene. Bookmark the permalink.